Neill’s bike fit service was established to present an alternative to the regimented, mass-produced bike fit services currently offered across the country. My bike fits are individualised. I don’t use mathematical or computer-generated “rules” because rules only tend to be OK for around 1/3 of the population who sit in the very middle of the bell curve of flexibility, strength and function – and these are often not the ones who have issues on the bike! I spend a substantial amount of time during each fit taking a history of injuries, cycling goals and aspirations, past problems and on-bike issues. I then assess your body in terms of mechanical symmetry, functional symmetry, neurological imbalance and cycling style. I use my skills and knowledge of human function and biomechanics to integrate the bicycle to your body, not the other way around. The end result is to achieve the highest level of functional symmetry that you can possibly perform with – that is both legs are performing as smoothly, equally and with as much control as possible on the bike. Your upper body should be unloaded, with little or no weight borne on the arms and back. The comfort advantages are obvious – vastly lowered chances of developing painful injuries, less muscle tightness and fatigue are the most obvious to the rider. Thankfully, this fit will also make you faster. As both legs work smoothly and with full control, more power is developed to push on the pedals. The torso is unloaded through careful positioning, freeing up valuable blood flow to divert to the muscles that are driving the bike forwards. The upper body is free of load which allows greater breathing efficiency and oxygen delivery to the muscles demanding it. You develop more power, with no pain except that of normal exertion, and you get back to what cycling really should be all about – enjoyment. I have raced at a state and club level in Victoria for many years and know what it takes to perform at your best. My interest in bike positioning stems from my own unusual problems on the bike which manifested as severe hip and knee pain. Overcoming these challenges with Steve Hogg’s help many years ago piqued my interest in this unusual area of human mechanics and has lead me to my current position – helping riders go faster, with less pain and greater efficiency. My own positional problems were extremely unusual and difficult to resolve, proving the hardest rider to fit is usually yourself! Nobody is symmetrical, yet the bicycle is a perfectly symmetrical apparatus. It stands to reason that any on-bike instability, asymmetry or imbalance will, over time and given enough load and repetition, manifest as a niggle, a pain, or a serious injury. Each hour of cycling on a road bike will result in your hips, knees and feet performing anywhere from 4000-7000 repetitions of movement depending on your cadence. Such numbers tend to bring out any small issues in your body, often the first manifestation is tightness, excessive soreness or fatigue after a ride in one area and so on. The last thing in line is usually pain. Pain is what happens when you run out of compensation strategies to get around your inadequacies on the bike. Everyone has inadequacies, nobody is perfect – some come close but none are flawless. If you struggle from on-bike pain, discomfort or would simply like to perform faster and better at any level – this is the bike fit for you. We love seeing clients who have had “professional” fits elsewhere with poor results. Neill offers a full money-back guarantee – and unlimited returns to the clinic for positional tweaks over the 3 months following the setup. Typically we will set you up and then allow your body to “habituate” to the new position over 4 – 6 weeks of moderate cycling. You then return for a further hour’s positional check to make sure that the new motor patterns have “taken” well and the body is functioning as expected. If there are any small issues that have cropped up as your function changes in the following weeks, we will address these and get the absolute most out of your fit. If you are still unsatisfied after allowing us to perfect your position a few times, and your issue remains unresolved, we will refund your fit costs and return your bike to its old geometry. In this way we ensure the very highest standard of care and guarantee your satisfaction. “But shouldn’t the fit be perfect right out of the box? Unfortunately the human body is a constantly changing apparatus. The asymmetries that your body presents with when you enter our clinic will not be the same asymmetries that you present with in 6 months’ time. You will adapt to the new position, and as you adapt your body will change. Tightness will release in your hips, legs, lower back and so on and your function on the bike will change. The way you function off the bike will also change – your gait will usually become more symmetrical if there were marked imbalances due to poor bike position. The new motor sequences that your body is using to push on the pedals will “embed” over 4-6 weeks of moderate cycling and you will begin to develop more power, for greater duration over the pedal stroke. As you change, the fit will change as well. Usually this process requires 4-6 weeks but it can be even longer in some riders if their asymmetries are longstanding and well regimented in their movement patterns. You can read more about this here. We only offer one level of full service, a Full Fit which will involve 4 hours of your time in our clinic and costs $595. Any further follow-up tweaks needed (beyond the 3 month mark post-fit) are book on an hourly basis at a flat fee of $150 per hour. The full fit price includes a pair of G8 Archtech 2600 or Sofsoles Fit Series arch support modules to fit your feet, virtually everybody will benefit from arch support – please see HERE for why. A portion of the cost MAY be rebateable on your private health cover, which means you usually end up around $400-$500 out of pocket for the fit, depending on the level of cover you have. 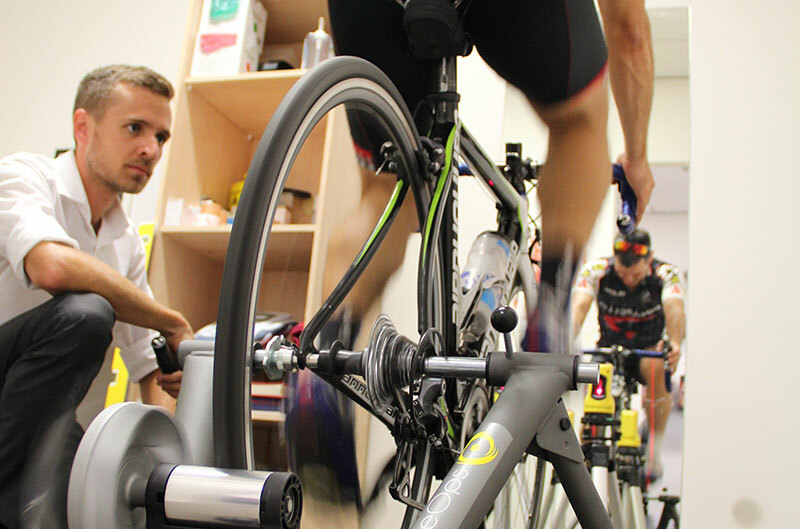 We suggest calling your health fund before your appointment as many of the funds are no longer choosing to cover bike fitting biomechanical assessments as a cost-cutting measure. When enquiring with your health fund, you will need to quote the treatment code “500 Initial Consultation” and my provider number, 2862687A. 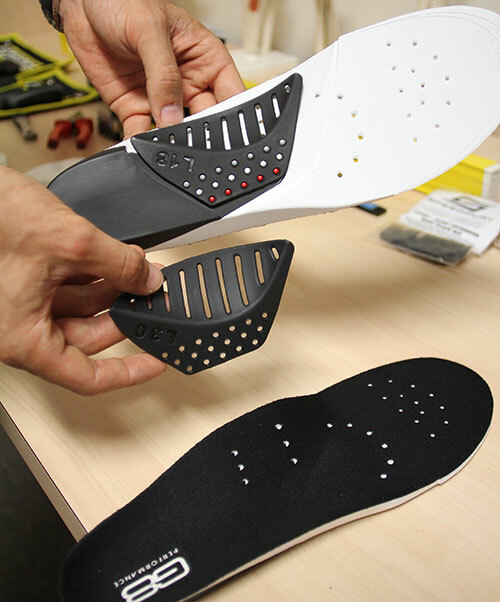 The treatment cost is $525, as custom orthotics such as the G8 inner soles are not considered part of the treatment process. Your regular riding knicks – ladies if you have them, please wear short knicks not bib knicks. A sports bra or singlet top is perfect – I will need to be able to examine the movement of your back and pelvis whilst on the bike. Any sunglasses or prescription lenses you use for cycling (wear your contacts if you use them whilst on the bike). 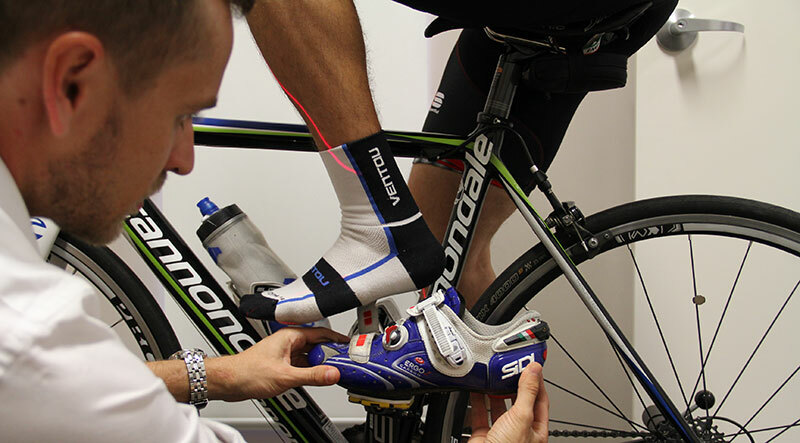 Your cycling shoes and any additional pairs that you will want to use whilst on the bike so that I can create the ideal foot correction and cleat placement in each pair. ALL clients will need positional changes on the bike. Some clients will need LARGE positional changes on the bike. If you are one of these, and the optimum position means that your stem is too long or short, or your bar width is far too wide or narrow, or your seat setback cannot be adjusted far enough forwards or backwards on your current seatpost, or your saddle is creating excessive instability of your pelvis on the bike, then I will recommend that you purchase one or more items from us on the day which will allow the required positional changes to happen. The most common issue is a wide or narrow pelvis which means that your foot separation distance is not ideal and the correct movement of your knees cannot be established. In this case I will strongly recommend that you switch to Speedplay pedal systems which allow us to fit a longer or shorter pedal spindle to change the foot separation distance. Speedplay pedals are also useful for attaining the correct cleat position – most 3-bolt cleat systems don’t separate fore-and-aft placement with rotational placement, meaning that a very limited range of cleat positions can be attained. In such cases I will often ask you to change to Speedplay pedals which are the only pedal system with the required adjustability in the positioning of the cleat on the shoe.